With nothing else to go on, I put this one aside and resorted to Windows Live Writer to blog. I looked in the exceptions list and saw this time it was empty. I closed IE, opened it again, and the list was populated. I repeated, this time using the link in the Outlook 2010 email and the list was empty again. IE seemed to be exhibiting some schizophrenic behavior. Lather, rinse, repeat. Soon, though, a pattern emerged. 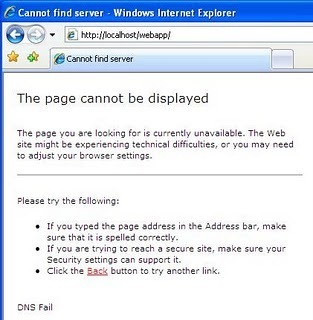 If I launched IE from the Outlook 2010 message via a link, I experienced a DNS fail. If I did the same using any other method, all was normal. I tried the link this time using instead Outlook 2003 that was installed locally on my workstation with no problems. I assumed the problem was with App-V Outlook 2010. In short, the App-V package keys were overriding the local registry keys defined by group policy, i.e. the proxy exceptions list key was blank for this App-V package . Until corrected, this could be worked around by simply populating the exceptions list manually from any IE session opened from a URL link from an App-V Outlook email link once. And since Word 2010 App-V also relies on this exception list, it also corrected the issue with failed blog post. This entry was posted on May 4, 2011 at 4:17 pm	and is filed under Troubleshooting. Tagged: Blogging, Networking, Process Monitor, Word. You can follow any responses to this entry through the RSS 2.0 feed. You can leave a response, or trackback from your own site.